Congrats, be on the lookout for your kindle version of Loves Music, Loves to Dance! I just can't resist one more suspense/mystery GIVEAWAY! Loves Music, Loves to Dance! Loves to read it, I do. I do. I do. I've read it so often, the book literary fell apart. So here's some info for anyone who's had their head in the sand and has never heard of her. BTW, I love her earlier books the best, but that's my problem. Mary is called the Queen of Suspense, and while she defines herself as a nice Irish Catholic girl from the Bronx, she sure can dip into the dark recesses of the mind and tell one whopper of a tale. Her writing has spanned 3 decades and she is the recipient of all kinds of awards for her work. The greatest being: when a reader puts her book down, they can't wait for the next one. Again, her earlier works were my faves, but she's still going strong at 83( I find two diff birthdates online, so I'll go with the younger one) I want those genes! 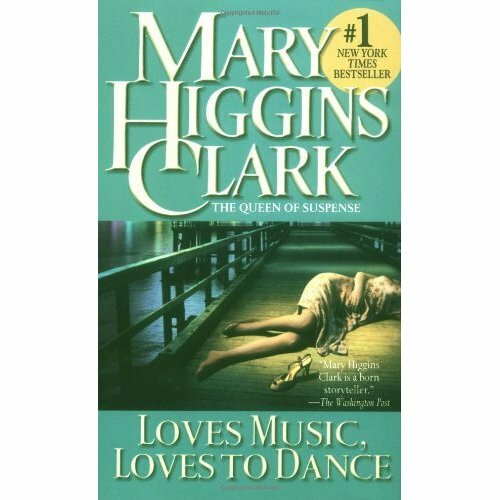 If you love music or you love to dance, OR you love psychological thrillers, this creepy suspense is for you. the kindle version of Loves Music, Loves to Dance! Dekker winners (who had to include emails) are Kathleen and Marjorie. Enjoy ladies. Sorry ladies. If you didn't leave your email you didn't get a chance, but better luck next time. Next week I'll be starting the romance giveaways. Tune in for a chance at some wonderful books! Yeah, congrats, Sherri Johnson and Jasmine A. Will get your books right out to you! Enjoy!!! You got it. Brandilynn Collins. Without being preachy, Brandilynn weaves tales of suspense with strong threads of faith. Her characters LIVE their faith rather than ram it down the readers’ throats, and isn’t that how faith is supposed to be shared? She does an amazing job of pulling you through the doors of dark and sinister, but she offers hope for her characters and for her readers. If you’ve never read Brandilynn, or even if you have, don’t miss a chance to win one of her books. Joanne Weeks is convinced in her heart that Baxter Jackson killed her best friend Linda(his second wife). In spite of what she finds, the police tell Joanne hands off the man who is a church elder and leading citizen in town. But Joanne never was good at listening and her determination has a mental bull’s eye on Baxter Jackson. Leave a comment and your email address today and Saturday and Sat. night I’ll draw names for two lucky folks. Share the news with your friends. Stop by tomorrow for a look at Brandilynn Collins suspense! And a chance to win one of her books! you are definitely missing out on a great balance of suspense and romance. So, to please you veteran Henderson readers and to introduce you newbies to Dee's books, I'm giving away a Kindle copy of her new book, Full Disclosure. Let's face it, folks. The lady can tell a complex suspense without sacrificing a great love story! If you're new to her books, drop by Amazon and read up on her 14 novels to date. Check out the O'Malley series, a fave of mine. Raquel Byrnes, who writes gritty in your face suspense without sacrificing the awesome romance. For more about Raquel, you can visit her at her website: www.raquelbyrnes.com and her writing blog, Edge of Your Seat Romance. I’m giving away a kindle copy of her book, Ruby Dawn, my favorite. When former street kid Ruby McKinney reaches out to runaways through her medical clinic in the worst part of the city, she encounters her first love, finally on the right side of the law. But can Tom Masters protect her from someone who wants to shut down her clinic? Ruby Dawn takes the reader into the dark side of gang activity while surprises reach out from each page. Is what’s happening to Ruby the result of some darker, more sinister action? Once you’ve read Ruby Dawn, you’ll be anxious for more. Leave a comment and your email for a chance to be put in a drawing for a kindle edition of Ruby Dawn. Well, there's no lying. I sometimes like my suspense peppered with a bit of humor to offer a tad of comic relief and Tim Downs is the author to give me just that. Starting out as a cartoonist, Tim has carried his humor into suspense that twists and weaves incredible tales full of gritty, unique, and more often than not, very quirky characters. In his Bug Man Series, character Nick Polchak thinks he's more bug than human in his job as a professor and forensic scientist, Polchak uses bugs, that right: bugs, larvae, maggots, oh yum! to determine how long a person has been dead. The kind of maggot that lives on flesh? Oohhhh, that's right, it must be the blowfly or something similar, but by the time you've read the book, you'll know more about flies and bugs than you ever thought you wanted to. Tim's books were recommended to me a couple years ago, and I've spent those two years catching up on all the Bug Man books he's written. To say he's quirky, is to say a two-year old is full of energy. Nick Polchak and his off again on again girlfriend make for wonderful reads. Here you go...the chance to win a three-book kindle bundle. Go for it. First person to post a comment AND LEAVE HIS OR HER EMAIL ADDRESS with those three things wins the kindle book bundle. If you haven't read any of Tim's books, head to Amazon where a lot of fun waits for you from this wonderful author. Guess what, I'm in a post Christmas ho-ho-ho mood. And because I love both suspense and romance, I plan to give away a lot of suspense goodies first, and then leading up to Valentine's Day, I'll add some romance packets. One in April, one in May, and one in August. An injured sailor, Jackson Judge, returning to Tennessee from Pearl Harbor feels as if life isn't worth living any longer. But his childhood friend, Barbara, not big on pity parties, has other ideas when she shows up from Indiana for his sister's wedding. She sees him with eyes of love. Jackson's kid brother, Will, brings back an orphan from the concentration camp Will helped to liberate. But his girlfriend Jeannine isn't exactly excited about becoming an instant mom. Barbara's kid sister Abby and Will's pen pal, however, bonds to the boy immediately, and Will can't help but notice she's not the freckle-faced kid he used to tease. A young woman must figure out who she is following an injury after a train derailment, because there's a farmer who keeps insisting she was on the train as a mail order bride to meet him, and he wants to be married immediately. But how can she marry anyone until she knows who she really is and why she was headed West? Then you'll love a chance to win books by Tim Downs, Brandilynn Collins, or Ted Dekker. And maybe something even more exciting than just a book!!! SPEAKING OF BECALMED! Let’s have a book giveaway. If you are the tenth person to leave a comment here, I’ll pre-order Becalmed for you from Amazon!!!!! With Eyes of Love and Always, Abby. WWII romance with an edge. I wanted to tell the story of the friendship of my aunt and my mom. They were sisters-in-law that were closer than sisters. And they had wonderful lives. My mom’s dad was an engineer, and she and the family followed him around the country as he built roads. They had so many strange things happen and one was being stranded in Tennessee and having to stay with the mayor’s family during Christmas. Mom was little then, but I aged her a tad and added the handsome mayor’s son and sister. So, while it’s totally fiction, it has some family legend included. Oh, both books are historic fiction-WWII. And I like to think it’s not your plain historic romance. I added some deeper, often darker issues of the war, while maintaining a true purist romance. The families are joined by the relationships of the children, and I won’t say more as I don’t want to give anything away. Way too hard. But here's the original foursome. Being drawn to each other as teens, Jackson Judge and Barbara Richardson are thrown together once again when Jackson’s sister is married two years later, but Barbara finds a much different man, a man who survived Pearl Harbor, but not the physical and emotional scars of the explosions. Both books are being published by Harlequin’s Heartsong Presents. I don’t even remember. It wasn’t too long, but the editing took forever. 8. What else about the book or story might pique the reader’s interest? It’s followed by Always, Abby. The story of Barbara’s little sister, and Jackson’s brother Will. When Will returns home from Germany, he brings with him an orphan from the concentration camp he helped to liberate. His girlfriend, Jeannine, isn’t all that excited about becoming a ready-made mom, but Barbara’s younger sister Abby, visiting from Indiana, is drawn to both Will and Hank. Again the families are drawn together and dealing with the repercussions of WWII…as well as love! So far this month, I’ve read a lot of articles about the future of fiction. I’ve heard that historic is being pared back, contemporary is pushing ahead again, that Dee Henderson has brought romantic suspense back to the forefront. So what is the real direction fiction is taking? When I first became an agent, I thought I’d be signing mostly suspense authors. And yet, historic fiction and historic romance have filled “most” of the slots thus far. I’m hooked on it. I also have suspense, romantic suspense, contemporary, and even a thriller. So what do they all have in common? Awesome writers…writers who make the written word come alive to all the senses. I not only see the protagonist, I hear her voice, see his eyes, taste what she tastes. And I feel their joy, sorrow, fears and more. I realize the industry can change from year to year, month to month, even day to day, but one thing does not change…good writing. And eventually that good writing will find a home. It might not be tomorrow or even next month, but it WILL find a home. Never forget my mantra; feel free to make it your own. When you have to write as surely as you have to breathe, then, and only then, are you truly a writer!